HAGLEY High School student Sammy Oakes is hoping to use the next four European Cup events as a springboard to the World Championships in Austria later this summer. Oakes will travel to Voiron, France, on April 6 in the first of his four trips across the continent which feature journeys to Austria, Germany and the Czech Republic. The 17-year-old, who is supported by and trains at Redpoint Climbing Wall in Worcester, also has the wider ambition to compete at the 2024 Olympic Games in Paris, France. Climbing will make its debut at the 2020 Olympics in Tokyo, Japan. 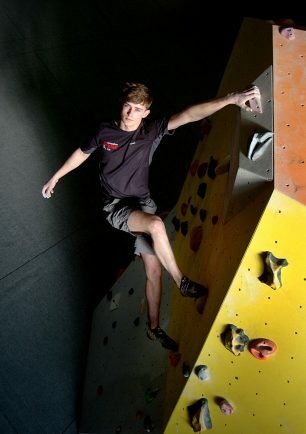 Some of Oakes’ successes include: three-time Welsh Lead champion, current winner of the Scottish Lead and Boulder Championship, winner of the Deep Water Solo competition held in Exeter, winner of the British Lead Cup which took place in Sheffield and second at the British Boulder Cup hosted in Nottingham. Andy Harvey, managing director at Redpoint Worcester said: “We’ve been involved in supporting Sammy since we opened and he’s a great ambassador for climbers of all ages and abilities.